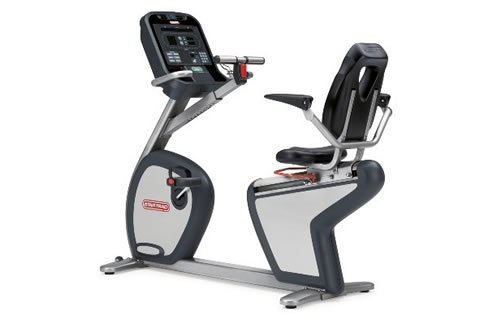 From the leader in user-focused cardio equipment comes the Star Trac E-RBi Recumbent Bike. With user-friendly entertainment features like a fully-integrated 15" Personal Viewing Screen (PVS) and conveniently-located media controls, the E-RBi Recumbent Bike is perfect for any member regardless of age or ability. iPod® connectivity allows any user with a video iPod® to watch media content on the 15" PVS, while enjoying all the user-friendly features of the E Series Recumbent Bike such as a convenient walk-through design, an adjustable reading station, armrests to alleviate shoulder tension, and a wrap-around seat adjust for simple position changes. Add our signature adjustable personal fans and you have the ultimate recumbent bike built with your members in mind.